Watch the Chesapeake Bay Video! Ever thought about this? About 71% of the earth is covered in water. The amount of water on the earth is a constant. We never make more water, but we don't lose any water. That's the good news. 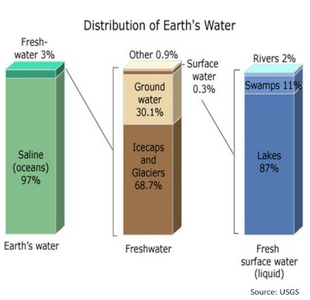 How usable is the water that covers the face of the earth? Ever tried to drink water from the ocean? DON'T! Only 3% of the water on the earth's surface is fresh water, and, according to the US Geological Service, 68.7% of it is frozen! You get the idea. We have very little water that is actually usable. We need to take care of the water we have.